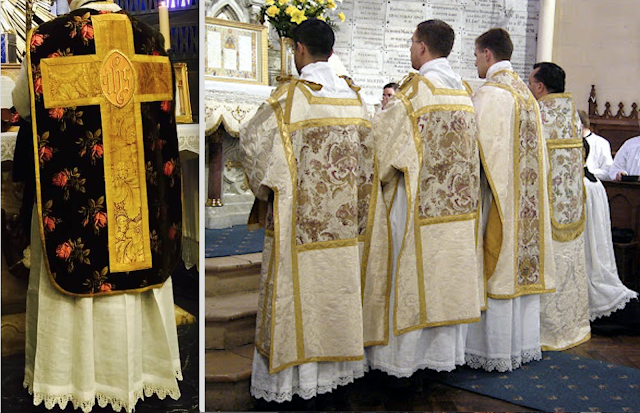 When it comes to the matter of albs or surplices with lace, typically one sees an all or nothing approach anymore. Either there are copious amounts of it or none of it. Either approach can be dignified, however, there is a via media. This middle way is represented by the use of lace on the hem of the alb or surplice, but only three to four inches worth. 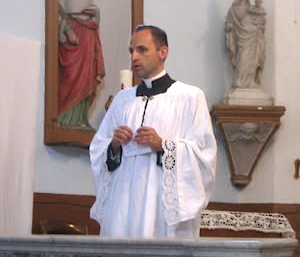 In the realm of the surplice, this particular look was popularized by the late Abbé Quoëx, as pictured here below, and has become popular amongst some of the younger generation of clerics attached to the usus antiquior, particularly in Rome and elsewhere in Europe. While I personally have no issue whatever with fuller lace ornament, these manifest this tradition of ornamental lace in a way that is both beautiful, traditional and yet characterized by a certain sobriety. Given the love-hate relationship that exists when it comes to this particular ornament, it might provide a good compromise and, what's more, it also has the practical benefit of being more cost effective to produce.